QUILTS - NOT JUST FOR BEDS! My latest miniatures obsession is quilting. I started sometime in the summer of 2001 and have been having a wonderful time ever since! Quilting has given me the perfect excuse to buy fabric and that's something I've always loved doing. It took many months of working up my nerve to try my first quilt, but once I bit the bullet and got going, there was no looking back. So far, I've just been making whatever the fabric inspires me to make so some of the quilts are more "art" style than "bed" style. 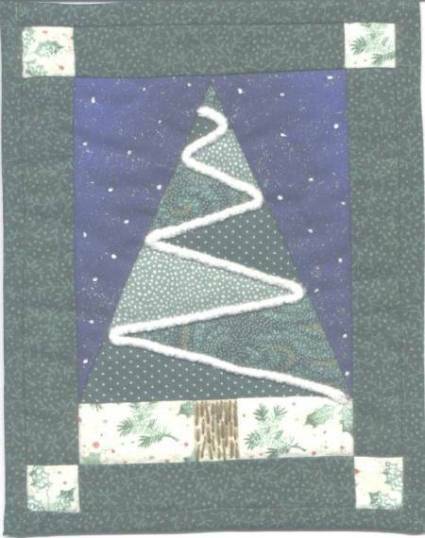 I'll continue with those (such as the Christmas tree, Harvest quilt, etc. ), cause they're such fun to do, but I will also keep adding more "bedroom" type quilts and, of course, will be happy to work up a quilt based on your color needs and my current abilities. 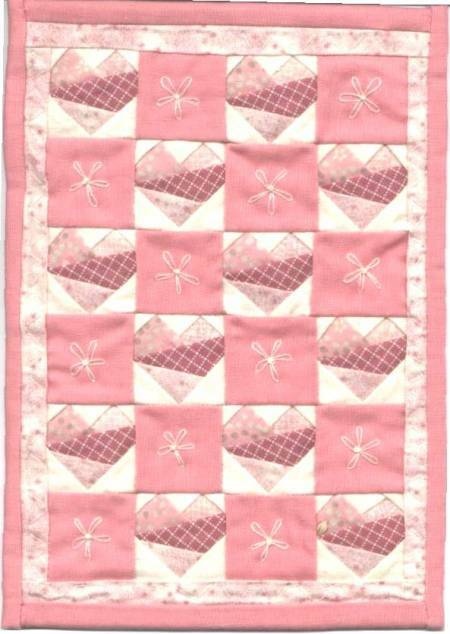 At present all of my quilts are made using the foundation piecing method on the sewing machine. Then once the quilt top is finished, I hand quilt it to the backing, using various embellishments, embroidery stitches, straight running stitch, etc. As usual, the pictures don't present the colors the way I would like. Because of that, if you purchase any of the quilts, I will hold your payment until you receive the quilt and make sure that the colors are pleasing to you. If they're not, just send it back within 5 days of receiving it, and I'll refund the payment, less postage. 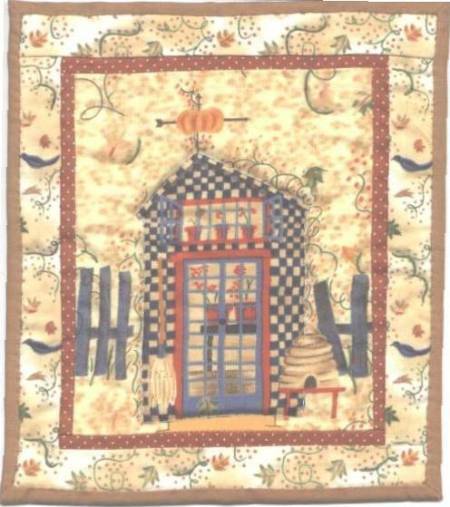 If you have any questions about any of the quilts, or would like to discuss a special theme quilt, please e-mail me - I'd love to hear from you! I've added pictures of some of the quilts I've already sold at the end of the page just to show you some of my other work. Didn't think to get pictures of all of them, though. If you're here to see the kimono quilt, here it is! It measures about 5-3/4" x 7". 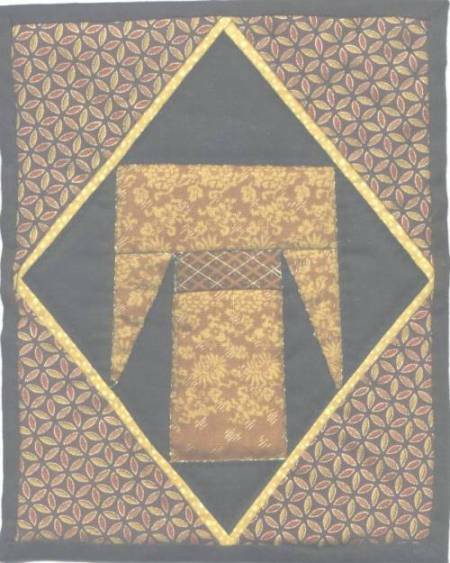 It is quilted all around the edges of the kimono with a metallic gold thread and the patterned corner angles are quilted with dark French knots. 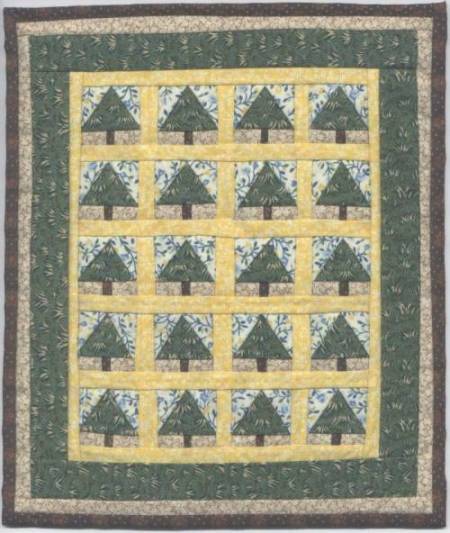 This quilt is my impression of a pine tree on a crisp, winter night. The "snow" is a chenille trim that I found and attached to the quilt using an iridiscent thread. The blue fabric has very fine glitter on it and I quilted it with white French knots. 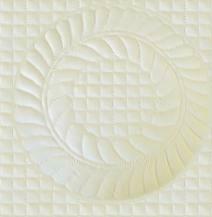 This quilt is also lined with foil, for shaping. It measures 6-1/4" x 7-3/4". Price: $30.00. And here's another tree but this one is all decked out for Christmas! It measures 5-7/8" x 7-1/8". The tree is "decorated" with a very fine gold cord and various sequins, beads, etc., that are sewn on to provide the quilting. The "walls" are quilted along each red line give it a nice puffy appearance. 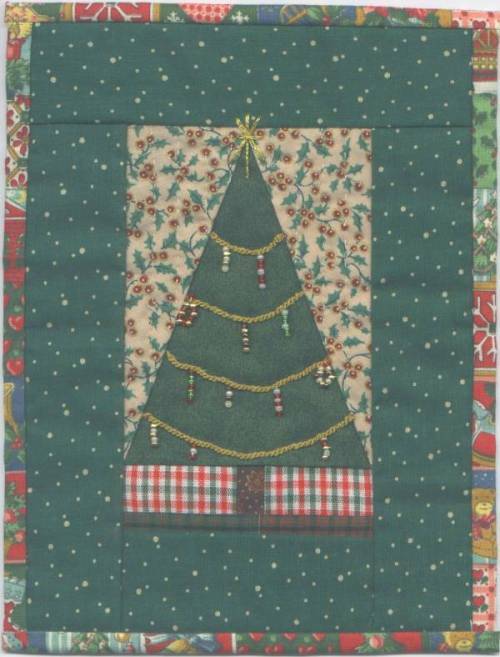 One of my favorite parts of the quilt is the "floor" fabric printed with Merry Christmas on each side of the trunk. Price - $30.00. This is my "Harvest" quilt. The center panel was on a piece of fabric I found and I immediately thought of a quilt. 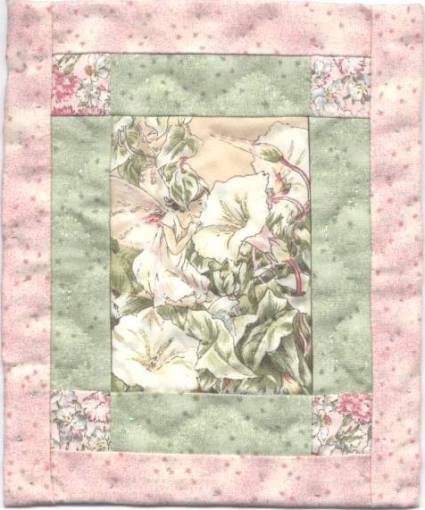 I added the two borders and the quilting is done by outlining some of the vines in the border and the center panel, and there is also machine quilting outlining the house, giving it a nice "fat" appearance. The quilt measures 6-3/4" x 7-3/4". It has the wire inserted around the edges. Price: $25.00. 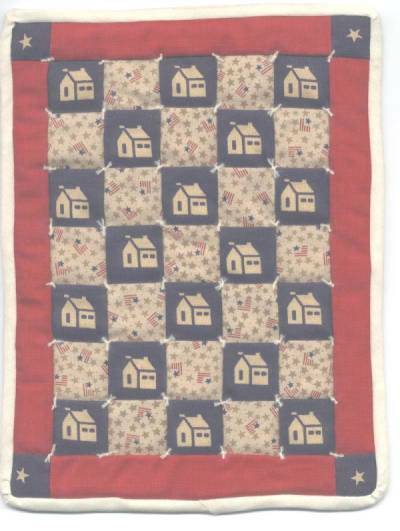 This was my very first quilt. I took it to a miniature show and it was stolen so someone must have liked it! 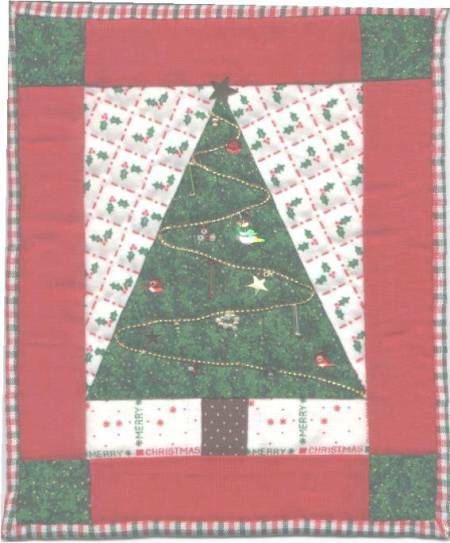 And this is another Christmas tree quilt which has been sold.